In the chapter entitled iOS 5 iPad Database Implementation using SQLite the basic concepts of integrating a SQLite based database into iOS 5 iPad-based applications were discussed. In this chapter we will put this knowledge to use by creating a simple example application that demonstrates SQLite based database implementation and management on the iPad. 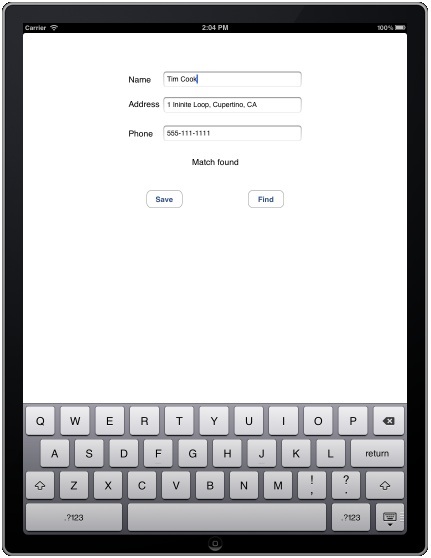 The focus of this chapter is the creation of a somewhat rudimentary iPad iOS application that is designed to store contact information (names, addresses and telephone numbers) in a SQLite database. In addition to data storage, a feature will also be implemented to allow the user to search the database for the address and phone number of a specified contact name. Some knowledge of SQL and SQLite is assumed throughout the course of this tutorial. Those readers unfamiliar with these technologies in the context of iPad application development are encouraged to first read the previous chapter before proceeding. Begin by launching the Xcode environment and creating a new iOS iPad Single View Application project with a name and class prefix of database. Once the project has been created, the next step is to configure the project to include the SQLite dynamic library (libsqlite3.dylib) during the link phase of the build process. Failure to include this library will result in build errors. The Link Binary with Libraries section lists the libraries and frameworks already included in the project. To add another library or framework click on the ‘+’ button to display the full list. From this list, select libsqlite3.dylib and click Add. Reports the success or otherwise of the operation via the status label. In addition, the code will need to clear the text fields ready for the next contact to be entered, and update the status label to reflect the success or failure of the operation. This code opens the database and constructs a SQL SELECT statement to extract any records in the database that match the name entered by the user into the name text field. The SQL statement is then executed. A return value of SQLITE_ROW indicates that at least one match has been located. In this case the first matching result data is extracted, assigned to NSString objects and displayed in the appropriate text fields. As an alternative, a while loop could have been constructed to display all matching results. For the purposes of keeping this example simple, however, we will display only the first match. The code then updates the status label to indicate whether a match was found, releases memory where necessary and closes the database. 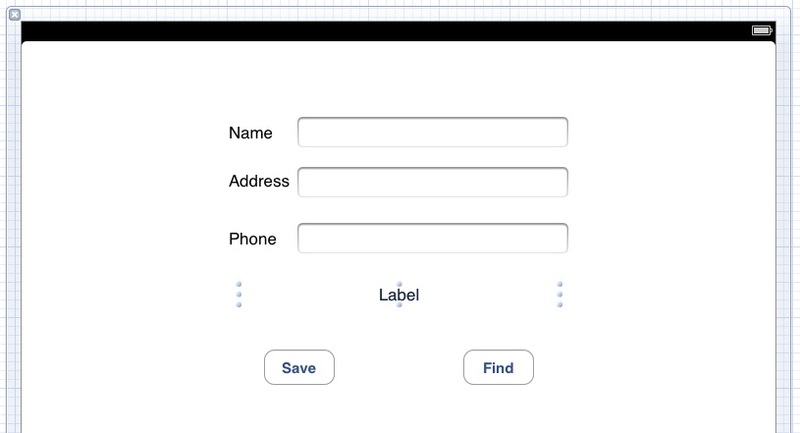 The final step in developing our example SQLite iOS iPad application involves the design of the user interface. Begin by selecting the databaseViewController.xib file to edit the user interface and drag and drop components from the Object library (View -> Utilities -> Object Library) onto the canvas and edit properties so that the layout appears as illustrated in Figure 39-2. Before proceeding, stretch the status label (located above the two buttons) so that it covers most of the width of the view as shown above. Finally, edit the label and remove the word “Label” so that it is blank. Next, connect the three text fields and status label to the name, address, phone and status outlets respectively by holding down the Ctrl key and clicking and dragging from File’s Owner object to the component in the view. From the resulting menu select the outlet corresponding to the selected view object. The last step involves connecting the two buttons to the corresponding actions. First, display the Connections Inspector (View -> Utilities -> Show Connections Inspector) then select the Save button in the editing canvas. Click inside the small circle next to the Touch Up Inside event in the Connections Inspector window and drag the blue line to the File’s Owner. To establish the connection, select saveData from the resulting menu. Repeat these steps to connect the Find button to the findContact action method. In this chapter we have looked at the basics of storing data on an iPad using the SQLite database environment. For developers unfamiliar with SQL and reluctant to learn it, an alternative method for storing data in a database involves the use of the Core Data framework. This topic will be covered in detail in the next chapter entitled Working with iOS 5 iPad Databases using Core Data.